We are so grateful for our special guests from last night: Elisa Camahort Page (Co-founder of BlogHer), Christine Arylo (author and spiritual catalyst) and Shiloh Sophia (artist and UN Speaker)! Each one brought her own take on our theme of “CONNECTION” and in fact, there were many connections we discovered just before the show. One was that our friend and AltSpaceVR Community Manger, Lisa Kotecki, independently knew each of them. Another was that the new AltSpaceVR office was in the same location as the original BlogHer office! We had Elisa’s take on community, taking action locally, and what it means to be an introvert or extrovert; Christine’s recommendation for how to get through turbulent times (hint: go spend time in Nature); and Shiloh’s invitation to think about your dream, and how to make space for a new possibility in your life. We’ll update when the replay is available! Until then, if you want to stay connected with us, please be sure to subscribe to our blog and/or follow us on Twitter and Instagram @ChewOnThisStory. Next show in Virtual Reality: January 17, 2017! On Tuesday, November 15 (6pPT/9pET) we are celebrating the theme of “Connection” with Elisa Camahort Page (BlogHer cofounder; SheKnows Media Chief Content Officer), author and spiritual catalyst Christine Arylo, and artist Shiloh Sophia. Q: Do I need Virtual Reality gear to join in? A: No Virtual Reality gear? No problem! Our show is presented by AltSpaceVR and they have options for you, including 2D mode (that means you can watch from your laptop). Q: Is there special software? Q: What if I have a question for a guest? We check these during the show and will reply as well as we can. HOPE TO SEE YOU IN VIRTUAL REALITY! Elisa Camahort Page co-founded BlogHer, Inc., in 2005 with Jory Des Jardins and Lisa Stone. The company was acquired in 2014 by SheKnows Media where she now serves as the Chief Community Officer. Elisa has appeared on or been quoted in USA TODAY, New York Times, CNBC Squawk box, and more. Together, BlogHer’s co-founders were named among Fortune’s Most Powerful Women Entrepreneurs in 2013, in the Ernst & Young Winning Women Class of 2011, and among the seven most powerful people in new media by Forbes Magazine. Elisahas also been honored as an NCWIT Hero, an AlwaysOn Power Player, and as one of the AWM’s Sixty@60. Elisa is a founding Fellow of the Society for New Communications Research and serves on the Board of Directors of the 42nd Street Moon Theatre in San Francisco, the programming advisory committee for SXSW Interactive and SXSW V2V, and the Board of Advisors for Oakland’s Hack the Hood and the Our Hen House animal rights non-profit. Christine Arylo is a transformational teacher, women’s leadership advisor and mentor, internationally recognized speaker and three-time best selling author. After earning her MBA and climbing the corporate ladder for a decade, she chose to devote her life to helping people transform and architect lives that were both successful + sustainable, in which their hearts and souls could thrive. Known as a kind of “modern day mystic” her transformational programs, workshops, retreats and talks based on the feminine power and leadership, yogic techniques and earth-based wisdom, have transformed the lives of over 35,000 women on 6 continents. You can tune into her thought provoking insights on her weekly podcast, Feminine Power Time, at http://www.FemininePowerTime.com or on her regular blog on Huffington Post. She loves speaking in person and virtually with people, and has been a featured speaker at TedX, Emerging Women, Kohler, Gap, Wharton and many other women’s conferences, retreat centers, and organizations and companies worldwide. Connect with her at ChristineArylo.com. Shiloh Sophia lives life as a great adventure narrated by the creative fire of her Muse! She has been painting, writing poetry, publishing books and teaching at universities, the United Nations and in her own programs and around the world for over twenty years. Her soul work is inspired by the idea that self expression is a basic human right. That each person has a right to know how they think, and feel, and the freedom to express that in the world. Her research and development around this idea has focused on serving women and girls through giving them access to methods of transformational art making through stories, symbols and inquiry. She is the co-curator and founder of the Intentional Creativity Foundation and Cosmic Cowgirls, a woman and girl owned school and they serve between 500 and 2500 women a month through revolutionary education. Their school, inn and museum is located in Sonoma County. She also has a teacher training, Color of Woman, which certifies women to teach Intentional Creativity worldwide. Currently there are close to 200 teachers in the lineage of Intentional Creativity. She lives in the vineyard lined hills with her husband, also a poet and artist, Jonathan. Their Muses can be found most mornings having tea and discussing quantum physics, philosophy and sacred texts in the Red Thread Cafe. We are dedicating this show to all the people who show courage through their creativity and by making a stand. We welcome TEDx speakers: author AJ Mattheis and comedian Nina G! Joining them we also have poet Jan Sollish, writer and solo performer Toni Weingarten, and singer-songwriter Lisa Marie Johnston. We also have items from comedian Kristina Wong, and authors Jake Ducey and Dave Nihill, available in exchange for donations to the Red Warrior Camp Legal Fund. Join us for our last show at The Marsh in Berkeley in 2016! Use code: CHEWONTHIS for discounted tickets. 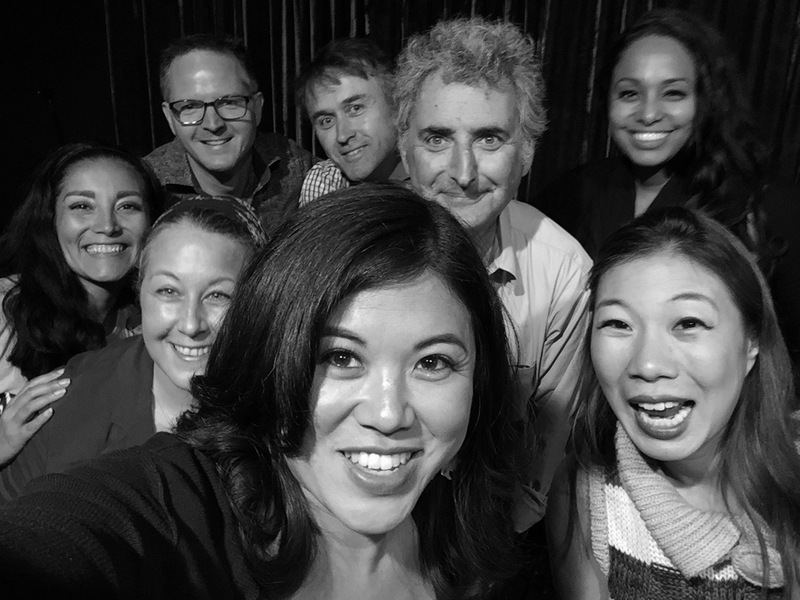 Many thanks to our friend and guest MC, Bruce Pachtman, for hosting our musicians, and leading improv storytelling for storyteller Chris Breen, plus Founder of Friendtier, Lynda Nguyen and team members. This week we catch up with friends in Sydney, and you’ll find us in Virtual Reality at AltSpaceVR on Tuesday, October 25. AltSpaceVR is busy this week hosting Reggie Watts, and all month presenting NBC News coverage of the US Presidential and Vice-Presidential debates. Don’t miss the chance to join us in 2016! 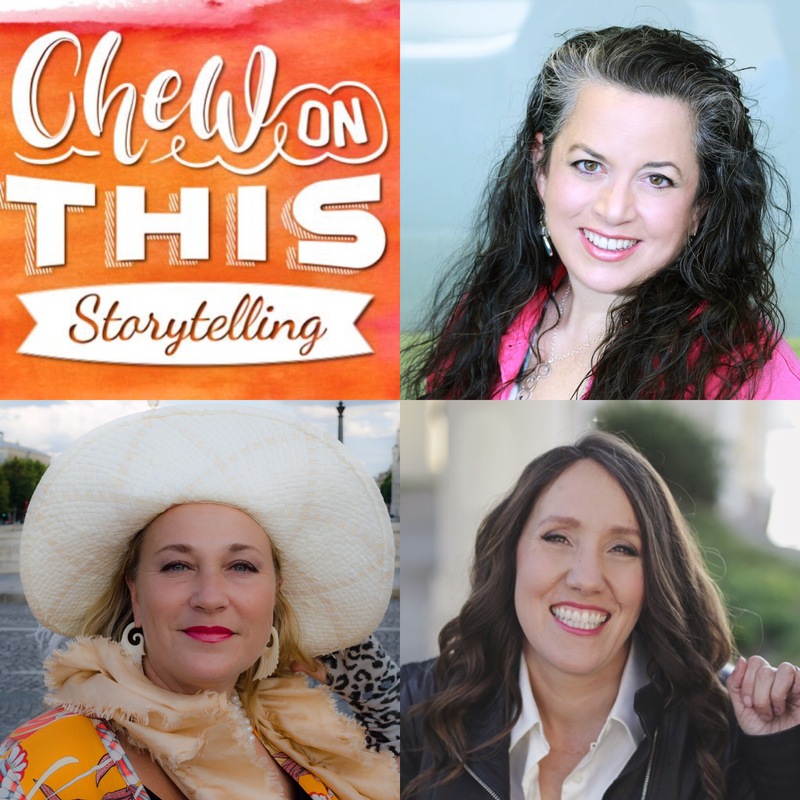 At Chew On This Storytelling we want to bring you stories to inspire you along your creative and entrepreneurial journey. On September 20 (6pmPT/9pmET; 21Sept 11am Sydney) we are thrilled to welcome Lynn Perkins, CEO and cofounder of UrbanSitter, and Wendy Lieu, CEO/Chief Chocolatier of Socola Chocolates. UrbanSitter began in San Francisco in 2010 as Lynn Perkins and her cofounders sought to find a solution like OpenTable for finding babysitters. With the expansion to other cities, join us to learn how UrbanSitter has navigated the growth to other cities like New York, LA, Chicago and Seattle. Wendy Lieu will share the story of how Socola Chocolates came to be a full-time dream realized in 2014, after overcoming incredible personal circumstances. We welcome you to join us and meet Lynn Perkins and Wendy Lieu in virtual reality, where you can ask questions during our live Q&A. And help us to celebrate AltSpaceVR bringing in Al Roker of the TODAY Show! 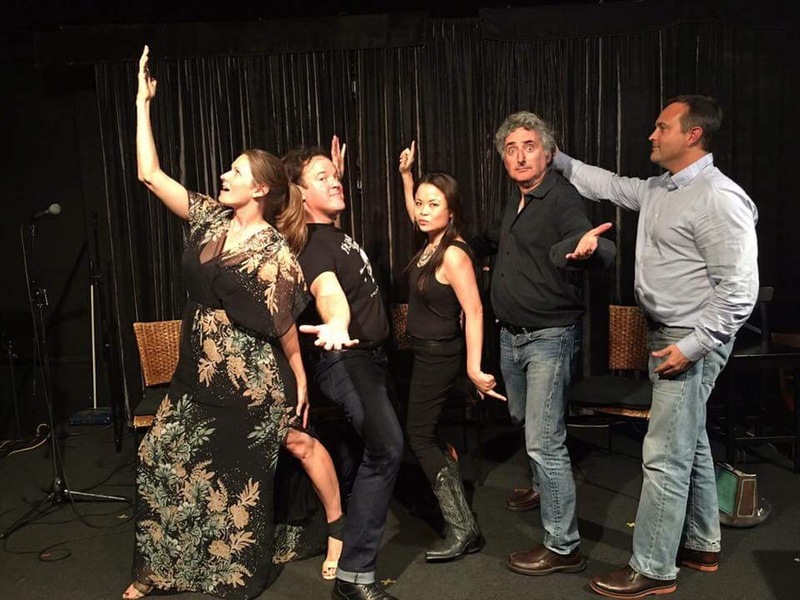 This makes Chew On This Storytelling the UnOfficial VR Late Night Show! Thanks to our special guests Kristina Wong and Saba Tekle for an incredible evening of stories and celebrating how story connects! After enjoying the musical creations of our house jazz trio, Signal to Noise, we began a conversation with Saba Tekle, publisher and author of 20 Beautiful Women, about how women’s concept of beauty can affect their sense of self, and how to bring out inner beauty. Kristina Wong delighted the audience with a never-before-told story of online dating, followed by an illuminating Q&A about her earlier work on “Wong Flew Over the Cuckoo’s Nest.” Thanks to our friend, producer Bruce Pachtman, we had cake to share with our audience. We gave away over $500 worth of prizes, including body products from Archetypal Musings, chocolate from Socola Chocolatier, a writing workshop from The Writing Pad, and a free photography session from Dara Rosenwasser Photography. If you missed the show, we’ll have some available in video soon. To see Kristina Wong in SF, join TOMORROW at the SF Asian Art Museum at 6pm (tickets only $5)! Join us on September 20 in VR at AltSpaceVR when we interview a local CEO and Chief Chocolatier! 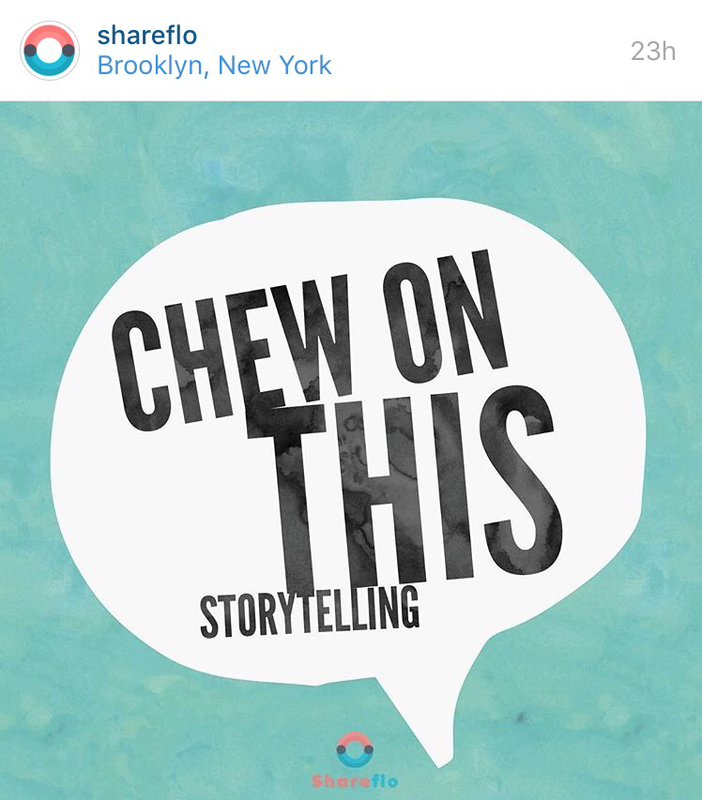 Chew On This Storytelling Meets Shareflo! 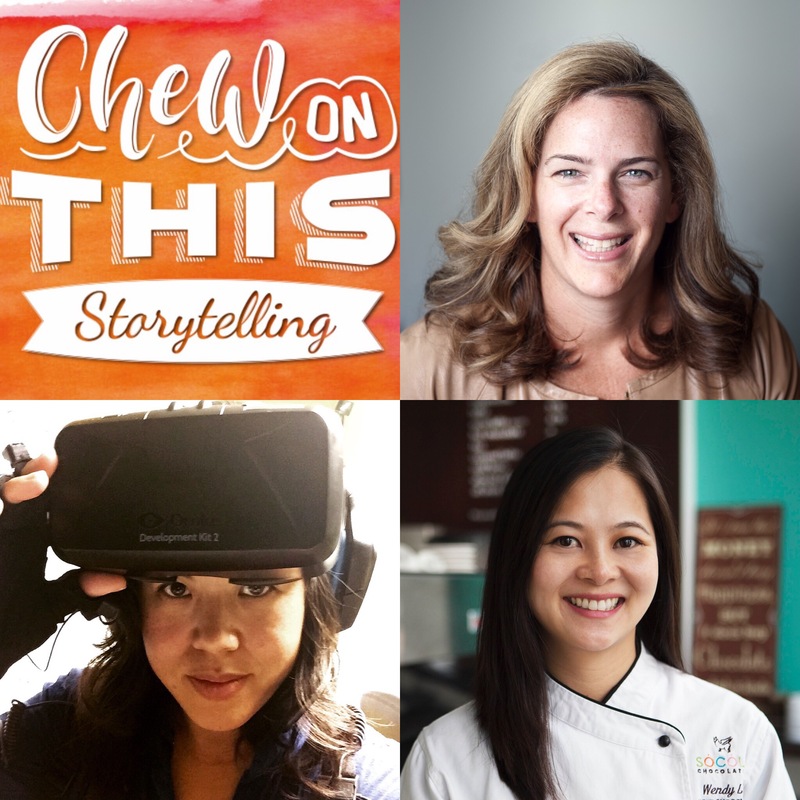 What started out as an intention to have Shareflo’s founder on Chew On This Storytelling became an opportunity for Cici to chat with the Shareflo team about being the first storytelling series in VR and what it means to bring community together. Thanks Shareflo for all you do, and hope to see you in VR soon!